1.1 If communication can fail, it will. The factors that can make human communication fail might not be very serious, when each of them is taken in isolation. However, there are so many risks and they can interact in so many ways that it is statistically almost certain that communication fails. Even if you pay great attention to make your communication unambiguous, effective, and understandable, there will still be too many risks you haven’t taken care of. Moreover, your measures are at best functional most of the time, which means that the combined probability for your communication to fail in at least one one of the ways in which it could fail is higher than you dare to imagine. When communication seems to be simple, easy and successful, it’s probably a total failure. The recipient looks happy and thankful, because he understood your message his way, which is what he likes, and very different from what you were actually saying. Being content with the formulation of your message is a sure sign of having formulated it for yourself. This Murphyistic remark is a warning about the very real possibility that ambiguities will be resolved in just the way you did not mean. Notice that this does not mean the worst misunderstanding you can imagine; rather, something worse – an interpretation you could not have imagined when you formulated your message. People who understand you can be a real nuisance. It might take some time before you see that they completely failed to see what you meant, but that does not prevent them for propagating their ideas as yours. There’s a widespread superstition that the more you communicate the better. In reality, increasing the amount of communication most probably just causes more misunderstandings. In addition to reformulating law 4, this refers to the fact that repetition strengthens false ideas. When people see the same message repeated over and over again, they usually start believing it. Even if your message happened to be true, they misunderstood it, so what they actually believe is not what you meant. And since the message has been presented so strongly, they tell it to their friends, who propagate it further, etc. Naturally, in that process, it gets distorted more and more. This law is just remotely related to the basic law. It is however more and more important: mass communication creates a world of its own, and people orient themselves in that virtual world rather than the real one. After all, reality is boring. Even more remote to our main topic, this simply states that events close to us look much more important to us than remote events. When there is an aircraft accident, its importance in Finnish newspapers basically depends on whether there were any Finns on board, not on the number of people that died. Similarly to law 6, this illustrates one of the causes of failures in communication. It applies both to senders and ecipients. The recipient tends to forget relevant things, such as items which have been emphatically presented in the message as necessary requirements for understanding the rest of it. And the sender, upon receiving a request for clarification, such as a question during a lecture, will certainly be able to formulate an adequate, easy to understand answer – afterwards, when the situation is over. 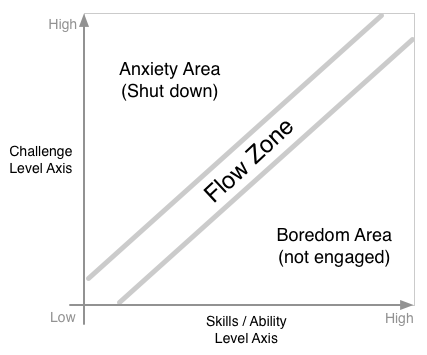 Achieving flow – or being in the ‘flow zone’ – indicates a player’s state between anxiety and boredom, meeting his own motivational level in that experience. CUE stands for Comparative Usability Evaluation. In each CUE study, a considerable number of professional usability teams independently and simultaneously evaluate the same website, web application, or Windows program. The number of usability problems in a typical website is often so large that you can’t hope to find more than a fraction of the problems in an ordinary usability test. There’s no measurable difference in the quality of the results produced by usability tests and expert reviews. Six – or even 15 – test participants are nowhere near enough to find 80% of the usability problems. Six test participants will, however, provide sufficient information to drive a useful iterative development process. Even professional usability evaluators make many mistakes in usability test task construction, problem reporting, and recommendations. CUE-1 to CUE-6 focused mainly on qualitative usability evaluation methods, such as think-aloud testing, expert reviews, and heuristic inspections. CUE-7 focused on usability recommendations. CUE-8 focused on usability measurement. Realize that there is no foolproof way to identify usability flaws. Usability testing by itself can’t develop a comprehensive list of defects. Use an appropriate mix of methods. Place less focus on finding “all” problems. Realize that the number of usability problems is much larger than you can hope to find in one or even a few tests. Choose smaller sets of features to test iteratively and concentrate on the most important ones. Realize that single tests aren’t comprehensive. They’re still useful, however, and any problems detected in a single professionally conducted test should be corrected. Increase focus on quality and quality assurance. Prevent methodological mistakes in usability testing such as skipping high-priority features, giving hidden clues, or writing usability test reports that aren’t fully usable. Usability testing isn’t the “high-quality gold standard” against which all other methods should be measured. CUE-4 shows that usability testing – just like any other method – overlooks some problems, even critical ones. Expert reviews with highly experienced practitioners can be quite valuable – and, according to this study, comparable to usability tests in the pattern of problems identified – despite their negative reputation. Focus on productivity instead of quantity. In other words, spend your limited evaluation resources wisely. Many of the teams obtained results that could effectively drive an iterative process in less than 25 person-hours. Teams A and L used 18 and 21 hours, respectively, to find more than half of the key problem issues, but with limited reporting requirements. Teams that used five to ten times as many resources did better, but the additional results in no way justified the considerable extra resources. This, of course, depends on the type of product investigated. For a medical device, for example, the additional resources might be justified. The number of hours used for the evaluations seems to correlate weakly with the number of key issues reported, but there are remarkable exceptions. Expert review teams use fewer resources on the evaluation and in general report fewer key issues, but in general their results are fully acceptable. The teams reported surprisingly few positive issues, and there was no general agreement on them. Many positive issues were reported by single teams only. You might ask whether the PAX Planner is really that bad, or if usability professionals are reluctant to report positive findings. Be careful when you report minor problems from a usability test. No one else may agree with you that the problem is worth reporting. Contingency design is design for when things go wrong . It’s the error messaging, graphic design, instructive text, information architecture, backend system, and customer service that helps visitors get back on track after a problem occurs. Defensive design is inspired by the concept of ‘defensive driving’ (that is , recognizing potential accident situations developing and taking advance measures to avoid them). (…) Site builders must constantly search for trouble spots that may cause visitors confusion and frustrations. PICTIVE (Plastic Interface for Collaborative Technology Initiatives through Video Exploration) is a paper mock-up technique that allows users to participate in the development process. A PICTIVE is a representation of a graphical user interface (GUI) or a Web page on paper. A PICTIVE prototype gives a user a sense of what a system or a piece of software will look like and how it will behave once it is finished. PICTIVE enables a non-technical person to contribute ideas to the development process.